I don’t think that I have witnessed or been so aware, so close to home, of an event of such historic significance in my lifetime. This is a momentous day in Scottish and British history. As a Community we have been inviting people to join us for 40 days of prayer in the run up to today’s Scottish Referendum. Most people have only come on board with the magnitude of this day of decision in recent weeks but it has gripped so many in Scotland over the last couple of years and whatever the outcome of today’s Referendum I believe it will have huge implications not only for Scotland, for its near neighbours England, the rest of the UK but the wider world, and certainly Europe. If as has been suggested the turn-out is as high as 90% it is one of the most remarkable electoral successes in modern democracy. 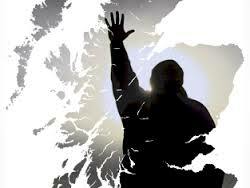 There is no disengagement with politics in Scotland today. The debate has captured the imagination, triggered conversation and rigorous discussion and arguments, ignited passions and carries with it both the potential for good as well as bad. I don’t get a vote but I feel quite passionately about the issue. 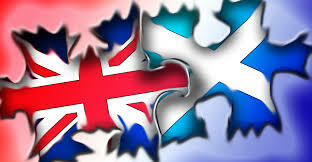 I am English but my mother’s side of the family came from Scotland so I feel some sense of connectivity. When I am asked to sign in a Visitors Book my nationality I always put ‘Northumbrian’! a spirituality and geographical area that transcends boundaries. I am also engaged with the Referendum because I believe it has thrown up issues that have wider consequences for Britain today. There is something within me that is very saddened by the prospect of Scotland becoming independent but I have not been convinced by the arguments used by the ‘No’ campaign which in recent days seems to be throwing promises, possibly empty promises, too late to try and avert what some consider would be a very retrograde step for the United Kingdom, if not disastrous. It might be my naivety but it also my abhorrence that everything seems to be based on economics and finances. There are more important values that shape a society for the common good! 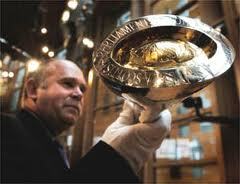 Engraved on the Scottish Parliament mace there are four words: wisdom, justice, integrity and compassion. As a Community we have been focusing our prayers around these four words and the Community team that has been involved in prayer initiatives like last year’s Flodden 500 Peace and Reconciliation Pilgrimage and Solemn Commemoration, have been to places like Bannockburn, Linlithgow and yesterday praying in the Scottish Parliament building itself and today they will be in Linlithgow, a strategic and significant place, historically and spiritually in the history of Scotland. 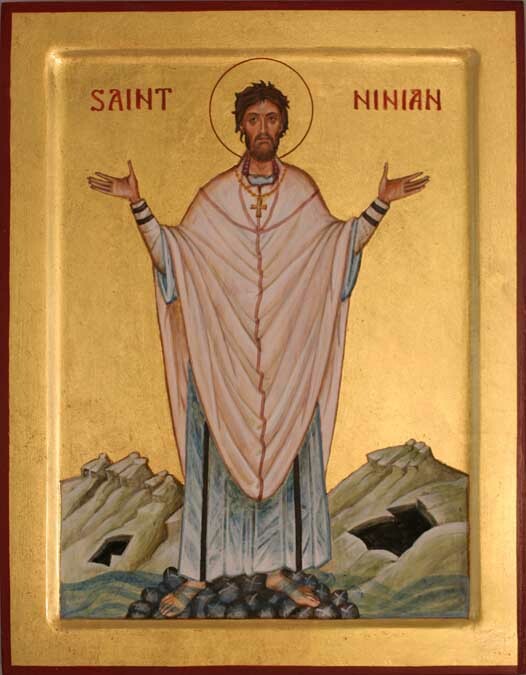 The prayer team and some other intercessors have felt drawn to using the Community’s Ninian liturgy which is A Call to Bless and for many of us we’ve been praying that the ‘spirit’ that Ninian brought to Scotland might be realised again in these changing and turbulent times. Certainly praying for God’s blessing upon Scotland is praying that in its governing there would be wisdom, justice, integrity and compassion. Things that need to be recaptured in the heart of Westminster among politicians of all parties, many of whom I believe have neglected these foundational imperatives that reflect a society that purports to embrace Christian virtues. Political leaders and financial institutions who have forgotten their responsibilities to the poor and marginalised of society, who have allowed the money markets to dictate, who have introduced policies including savage cuts that affect the poorest and most vulnerable in our society. Economic policies that are morally repugnant and certainly do not reflect either wisdom, justice, integrity and compassion. The lack of morality in the marketplace, the inability of the ruling political classes to understand what is happening in the heartlands of many of our communities have, I believe, contributed greatly to the feeling of anger and disillusionment with government in and by Westminster. Successive Governments who have bought into and peddled the false and deceitful lie of “trickle down economics”, the idea that if you help a certain percentage of the population to get rich that the money will trickle down to the poorest. Take morality and responsibility to be our “brothers keeper” out of the equation, ally it with greed and selfishness and you create a society where the rich get richer and the poor get poorer. A government that is prepared to spend billions of pounds on improving a rail link between London and the Midlands whilst allowing other parts of Britain to struggle is a government that cares little for those outside of London, the South East and those precious and all important marginal constituencies. When government ministers talk about improving connections with the North will somebody give them a map and point out that where the North is! It does not stop, in fact it just begins in Manchester and Leeds. Come the Revolution I shall publish a Road Atlas that begins in the North and gets smaller scale as it moves south beyond Watford Gap! A government that presides over economic development grants that favour the areas that are affluent over beleaguered, struggling communities across vast urban, suburban and rural areas beyond London and the South East. I believe that our government and previous governments have much to say sorry to Scotland, the North of England and no doubt Wales and other areas about. Those who fear the break-up of the UK if Scotland goes independent may need to see that a lack of wisdom, justice, integrity and compassion have sown the seeds of mistrust and reaped the consequences of Scotland becoming an independent nation. I have a number of Scottish friends whom I have had lots of conversations with whilst curling last winter and playing golf this summer in the Borders, conversations which have been dominated by the Referendum. Everyone of them remembers being inflicted with the Poll Tax back in the 1980’s, the legacy of which virtually obliterated the Conservative party from Scotland and has played into the hands of those who have no trust in the present government. 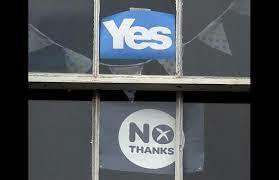 I really don’t know what will come of today’s Referendum or the real implications of both a “Yes” or a “No” vote. I am deeply concerned and prayerfully committed to pray for peace and reconciliation both within Scotland in the aftermath of the Referendum and also in its relations with other countries, including England. The present political furnace has fuelled much passion and triggered some ugly scenes of hatred and schism. This is surely not what any party, pro or anti independence wants for a country so historically seeped in the Christian tradition. There are lessons to for the official opposition, the Labour Party, aligning themselves with a coalition government that has paid scant attention to the regions beyond London and the South East. I write as a member, albeit a disillusioned one, who sees the pale shadow in today’s Labour Party of that which was founded by the Scot Kier Hardie and others in 1900. Professor Bob Holman, a Christain, following the example of the Incarnate Christ, has lived and worked with the poor in the disadvantaged area of Easterhouse in Glasgow has written a brilliant book on Hardie in which he points out that the founder belived that the Labour Party should serve the masses; working-class people and speak out for those who had no voice, fight injustice and alleviate poverty. He also argued that the majority of MP’s should come from the working-classes. He visited Oxford and Cambridge universities, where access then was largely restricted to those from public schools. At Oxford he observed that graduates had easy access to the Commons, and wrote: “They will go out into the world as unfitted for the task … Most of them will know as little of the real life and feelings of the common people as if they did not exist.” How his words resonate with today’s MP’s and particularly those in the cabinet governing the country. Today the number of MPs from public schools and Oxbridge is far in excess of their proportion in the population. The imbalance is also witnessed in the Labour Party, with those from ordinary, working-class backgrounds very small. It is I believe one of the reasons why many MPs have little understanding of the people and communities they are called to serve and represent. Hardie’s political manifestos advocated more public control. He wanted the nation to run the services essential to health and social wellbeing. 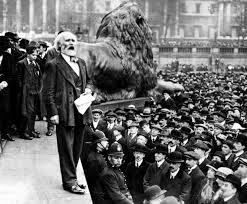 His manifestos included the nationalisation of railways, mines, land, banks and pensions, votes for women, rights for workers and free education for all. I think he would turn in his grave if he knew that the party he founded was years later to be led by a leader who deceived Parliament, led us into an illegal war and undermined the whole credibility of the United Nations. A war that most Scottish MP’s, certainly all SNP and Liberal Democrats, opposed in the House of Commons. A war that no Scottish Assembly would have sanctioned. A war that has led to the loss of hundreds and thousands, if not millions, of people. Violence and bloodshed breeds further violent, bloodshed, conflict and war. The fact that a Labour Prime Minister, Tony Blair is a Peace envoy in the Middle East is sick. He should instead be standing with George Bush in the dock of the International War Crimes Court in the Hague. What we and America unleashed by entering into the Iraq War, thinking arrogantly that we could bully and alleviate terrorism by bombing thousands of people, imposing our Western ways and causing untold misery, suffering and exacerbating the problem, is lamentable. If a fraction of the money, the billions of pounds that have been spent on war could have been used to alleviate poverty, address injustice, provide education, food and water, better health care and homes for the homeless, worked for peace, bringing enemies to reconciliation rather than supplying them with weapons of destruction, many of which are now used against our Allied forces, we might not be in the horrendous mess that we have, in my mind, majorly contributed to. We have poured fuel on the simmering fires of unrest in the Middle East and created a cauldron that has unleashed such barbarity and evil. In the process, we have created enemies instead of friends, conflict instead of collaboration, war instead of peace. Pope Francis last week spoke about outbreak of a “piecemeal” World War III with the current wave of violence, massacres, brutality, violence and conflict, which has spread to over sixty nations throughout the world. Certainly the world, in many places, is at war. The age in which we live is an increasingly violent one. Lord have mercy upon us, forgive us our sins and deliver us from evil. I genuinely don’t know what I would vote for if I were living in Scotland today but what I can pledge is an unswerving commitment to pray for God’s blessing upon Scotland, its land and people and that, trusting in the tender mercies and constant and compassionate love of God, whose ways are seeped in wisdom, justice, integrity and compassion; that his will be done here on earth as in heaven. I’m also encouraged and privileged to be part of a Community that reaches out across cultural, social and ecclesiastical divides and am delighted to be part of the prayer initiative that sees folk from England and Scotland praying and sharing together. People with differing views on the Referendum, some for and others against the idea, representing that whatever the outcome, we will stand alone yet very much together in Community. In so doing, we pray that the same Holy Spirit that inspired Ninian to bless Scotland will be at work blessing the nation and overshadowing and guiding its people this day. Thank you Roy for a very helpful reflection today. You capture the sadness and anguish of the past alongside hope in God for the future. It was a privilege to read it. Looking forward to spending a few days with the Northumbria Community next week. It has not been an easy few weeks here in Scotland and I hope and pray that this campaign will not leave damaging divisions. If we can remain engaged in a process of increasing hope and social justice in our island that would be a real answer to prayer. Thankyou, Roy. I weep with you over the loss of integrity within English politics. 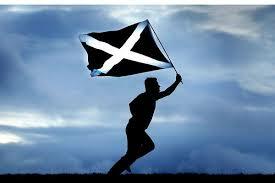 We wake this morning to news that Scotland remains within the UK – and rejoice. But that rejoicing will surely be shortlived unless we see politics once more infused with Christian values! By the time I got round to reading this, the votes were cast. However, it seems to reflect my vague uncertainty on what is right except that we English need the Scots far more than they need us. A fact that, at least obliquely, all the party leaders seem to agree with! I have to say, coming from the South-East, how refreshing it is to hear someone glimpsing the message of Christ in the values of left-wing politics. Down here I am a bit of an aberration! Thank you for the writing. Keep them coming!